Let’s be honest. When most of us open our Bibles to read, there are some books, some passages, and some verses we like and read more than others. More times than not, I would bet we spend most of our time in the New Testament. If we do spend time in the Old Testament, we probably read the Psalms or maybe Proverbs. Those books are very poetic, and contain such practical wisdom! Who wouldn’t love reading them? Now, most of us probably wouldn’t be so blunt…but I have a feeling, that even if we wouldn’t verbalize things quite that way, I think practically in our personal study of the Scriptures, that’s how we approach the Bible. Take for instance a book like Leviticus. Most of us probably wouldn’t associate the book of Leviticus with the Gospel. Leviticus is one of the five books of Moses that we call the Law. Normally when we start our yearly Bible reading plans, IF we start a yearly Bible reading plan, or if we’ve ever attempted to read through the bible in its entirety…I would imagine that more times than not, Leviticus is the book that we end up getting bogged down in. And there are probably many reasons for that. As you read through the book you’ll find that basically the entire book is instructions in regards to the various offerings and sacrifices that the people were supposed to offer to God. In this book we see Moses talking about burnt offerings, grain offerings, peace offerings, sin offerings, guilt offerings…and on and on it goes. So, as we read through this book, it can be quite easy to get a bit bored (Let’s just say it)…especially because as we read through this book, we really don’t see how it applies to us. I would love to take the time to tell us all about how these various offerings and sacrifices all point us to Jesus and see His Gospel, but for now time doesn’t allow. But, let me say first and foremost, the reason we should read a book like Leviticus in particular, and the Old Testament in general…is because it’s the Word of God. And as the inspired, God breathed Word of God, it ought to be important to us! These words by Paul, do not simply apply to the New Testament, though they do…but we have to remember, that when many of the Apostles and their associates were writing their letters and going around from town to town preaching the Gospel and planting churches…the New Testament as we have it didn’t exist. They, inspired and empowered by the Holy Spirit were in the process of writing it and putting it together. But yet, we see God working powerfully through their preaching. And what Scripture were they primarily teaching and preaching, and appealing to in order to make their case that Jesus was the Messiah? It was the Old Testament! So, when Jesus was preaching Jesus, what did he do? He went back to the Old Testament and he preached the Scriptures. My point is this, the Sacred Scriptures for the Christian doesn’t start in the New Testament with the book of Matthew. But Jesus himself tells us over and over again that the entirety of the Bible, including the Old Testament and the books of the Law are about Him. There is not a book in the Old Testament (Or the New) that we can’t see Jesus, teach Jesus, preach Jesus, and glory in the Gospel, because the entirety of the Old Testament was written to testify to the Jesus that is beautifully revealed to us in the New Testament. There are tons of great deals today for Kindle! Give them a look. Any chance you get to add Spurgeon to your library, you probably should. Especially for just $1.99! Randy Alcorn is one of my favorite authors. These are smaller books and a couple have been adapted from some of his larger volumes, but they are still packed with meat and well worth these prices. And finally, here are three study guides from Rose Publishing. I’ve not read these, but they look really good. Hi guys, I know it’s been a while. Just letting you all know I’ve recently published a short Bible study. It is designed for personal, family, or church use. Here is a little bit about it, followed by a link to the kindle version. When the link to the paperback is ready I will post that as well. “In the daily struggle to honor God and to love those closest to us, many have grown weary. We are restless. From where will our rest come? 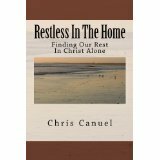 Join Chris Canuel in this short bible study exploring the causes of restlessness in our family lives. After discussing the causes of this restlessness that so many of us feel, Chris will then point us to Christ and the glorious rest that only He can offer. Purchase now for just $1.99!